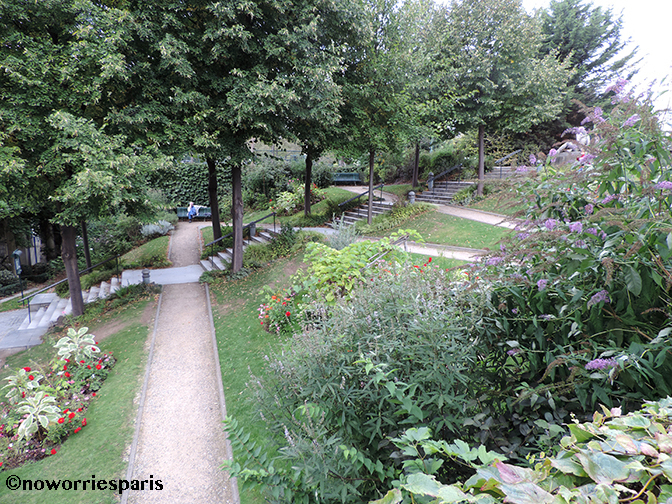 Out of Paris’s 400 parks, the tucked-away Square Georges Cain, an oasis of greenery, gets my vote for poetic escapes. 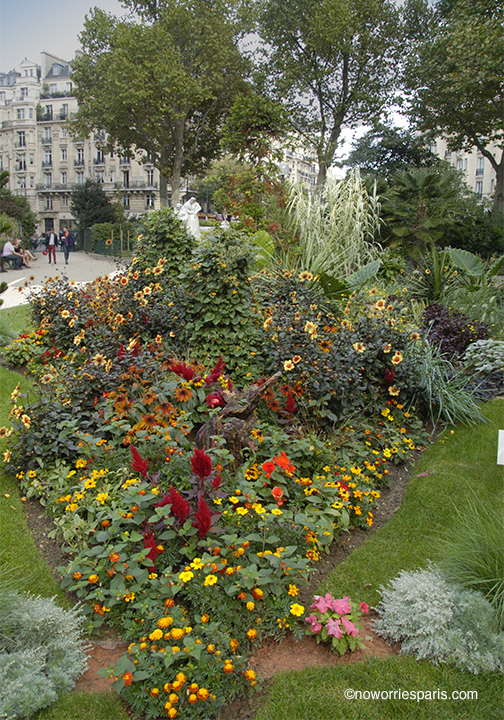 Maybe it’s the circular design, the gardeners’ decision to fill the center surrounding the statue of Aurore with a sea of orange long-stemmed roses in the spring, or to color coordinate all the other flowers with a pastel palette to complement the archeological relics around the perimeter. The sign at the park’s entrance reads “colors too bright would monopolize the view of the passer by.” Walk in, sit down and I guarantee you’ll feel soothed. There always seems to be an empty bench, just how the neighborhood regulars like it. Who was Georges? Answer: a painter and writer who was a long time curator (1897-1914) at the Carnavalet Museum. Pieces from the history of Paris dispersed in the square include the remains of the previous Town Hall, Merovingian sarcophagi, and the pediment of the central pavilion of the Tuileries Palace still blackened from the fire that destroyed it. 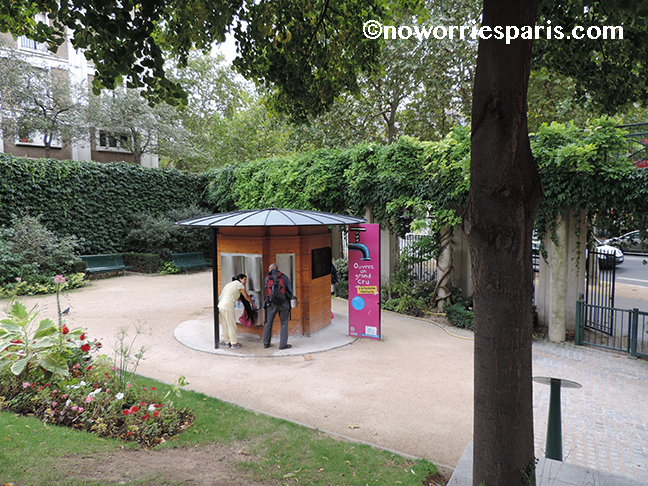 If you intend to visit Musee Picasso or Musee Carnavalet, this is a place to head for afterwards . Your feet will thank you and you’ll have a chance to read your No Worries Paris guide for where-to-next inspiration. Stay long enough and you might have a chance to hear ” Le Rossignol Electrique’ by Eric Samakh (1990), a small electronic bird that starts singing whenever the wind blows (iffy in the summer). Spring is here and locals know there’s no better place to enjoy the blossoms than strolling or jogging the Promenade Plantee. 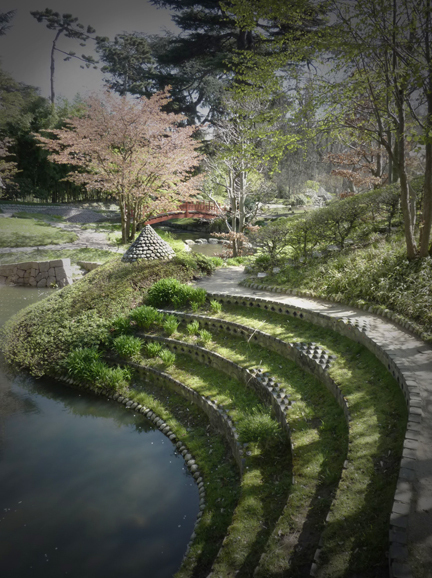 The Jardin de Reuilly (midway) lures visitors in with it’s artistically planted terraces, large circular lawn and rose garden. It was once the site of the ancient Chateau de Reuilly, a vacation house for the Merovingian kings. 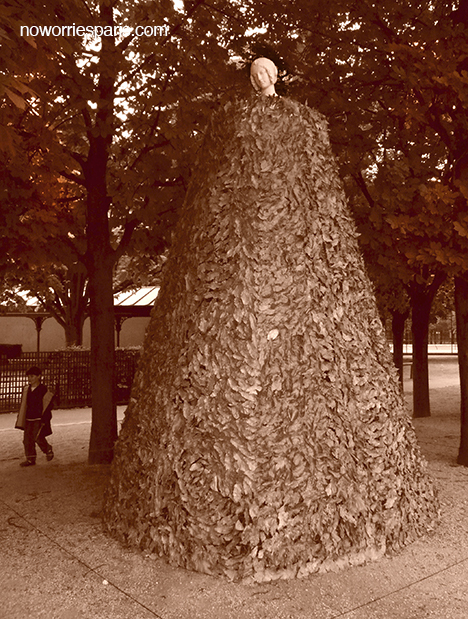 At the main entrance (l’avenue Daumesnil) lies France’s first public fountain, still operational today. 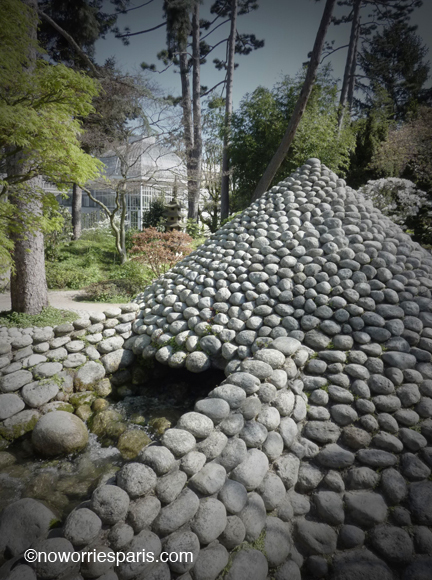 Tap water from the public pipes is pumped into the fountains, where it is chilled to around 6 degrees C (43 F). The CO2 is introduced into the mix right before the water comes out of the faucet and into your bottle/cup. Noise, crowded sidewalks and tourist attractions are exhausting. 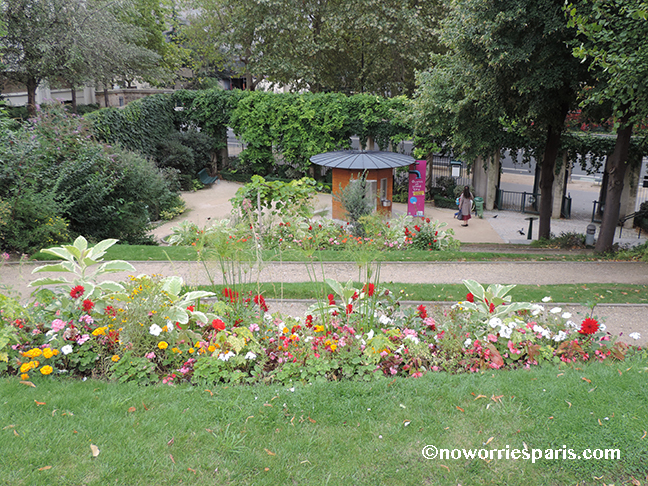 Taking a break in one of Paris’s beautiful parks can be a refreshing interlude. 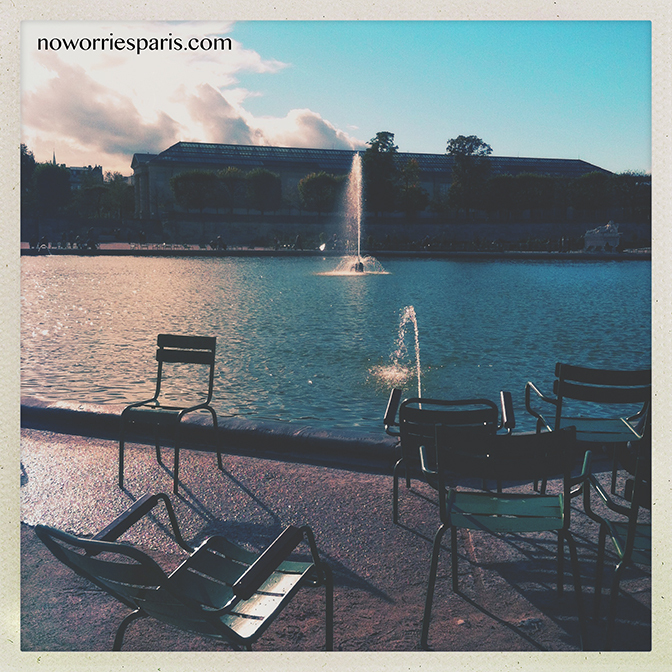 Sit and staring, reading your guidebook (No Worries Paris) or munching on a sandwich are acceptable activities. No smoking please. Chill. 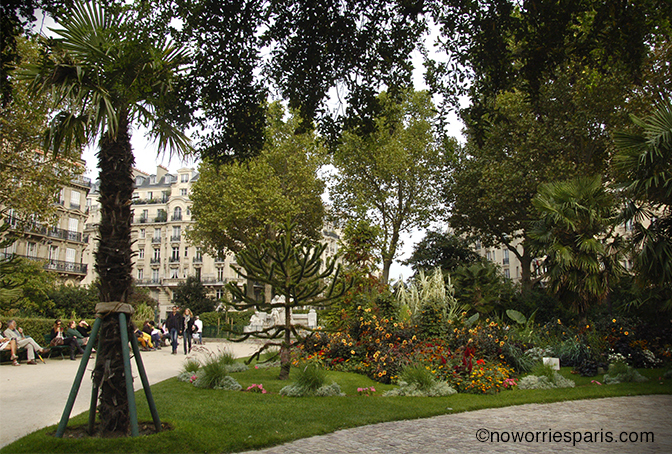 Visiting this square filled with exotic plants and artistic plantings located across from Bon Marche department store can be a magic moment. Bon Marche has a gourmet deli, grocery department and outstanding patisserie for all your picnic needs. Eat, rest, shop ’til you drop. 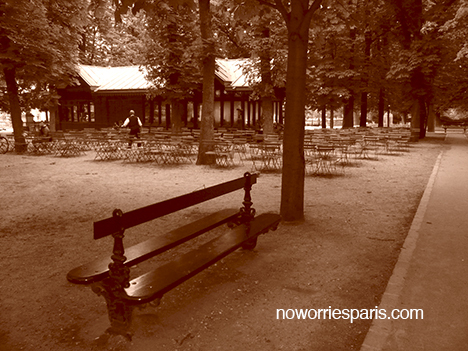 This is an activity off the beaten tourist path, so share a bench with a local and enjoy your splendid day in Paris. Walking Tour One, along the major monuments of Paris, is the perfect way to spend day one after being cooped up in an airplane. The grand scale of the city is revealed from wide-open formal parks. First-time visitors will see many of the major sites, and Francophiles will become reacquainted. You could spend a week making the worthwhile stops of the walking tour. For that matter you could spend a week at the Louvre. But you can also spend one long day with enough time to dip in here and there for stops—and come away with a grand sense of place. This walk is also easy to navigate. 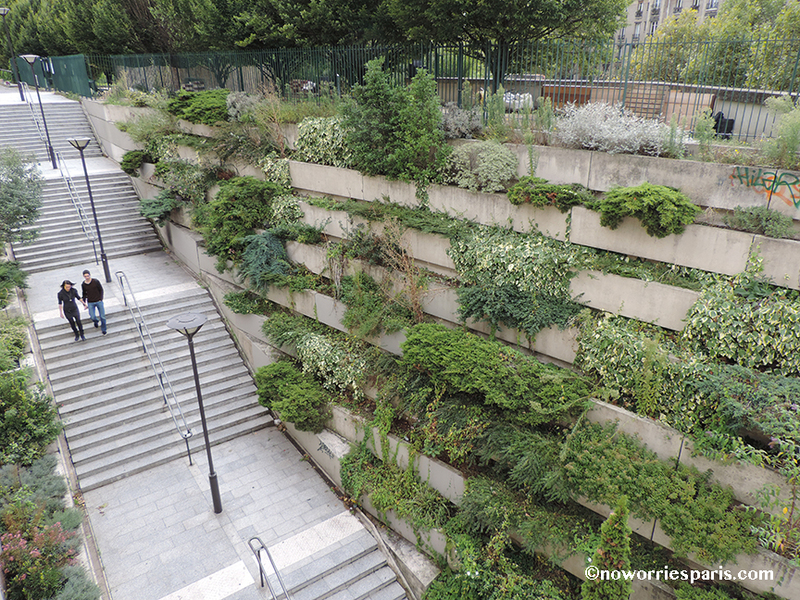 For a more leisurely pace, Walking Tour One, can be divided into two days: Spend the first day around the Tour Eiffel, and instead of crossing the river to Avenue George V, continue by seeing the sights of Promenade One, page 152, which is adjacent to the Eiffel. 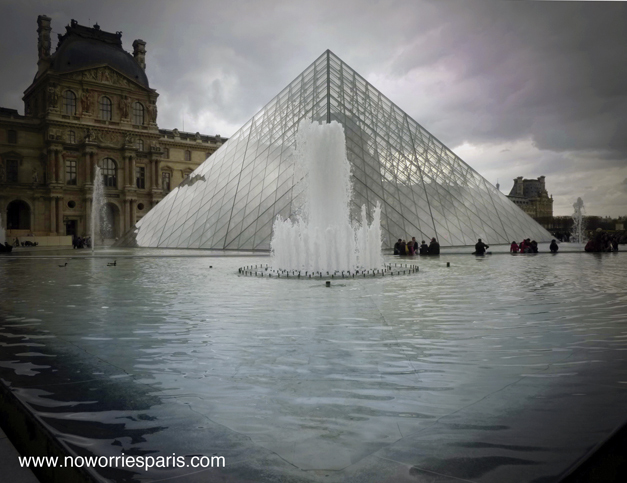 On day two, start at the Arc de Triomphe and take in the Louvre. 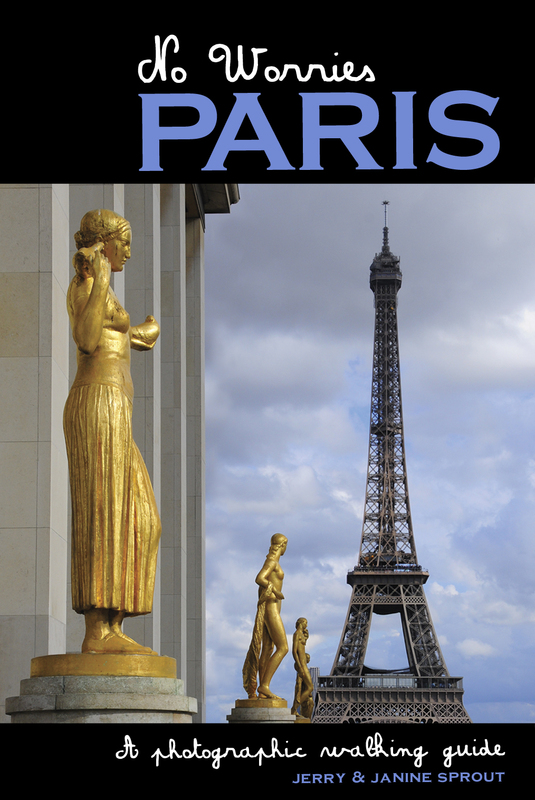 For the accompanying walking tour map and much more detail about this outing, buy a print, Amazon Kindle or Barnes and Noble copy of No Worries Paris. 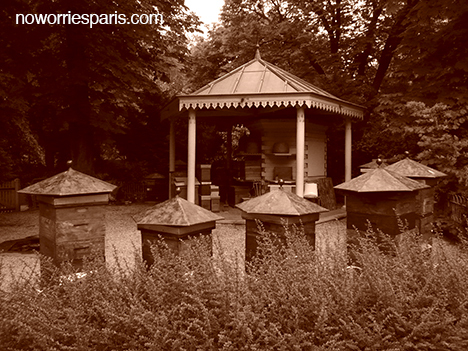 The beehives are in a hidden corner. See if you can find them. Art in the park. Now gone. I can’t always write about fashion and food so I’ll bore you with a little history today: Paris’s Historical Axis. 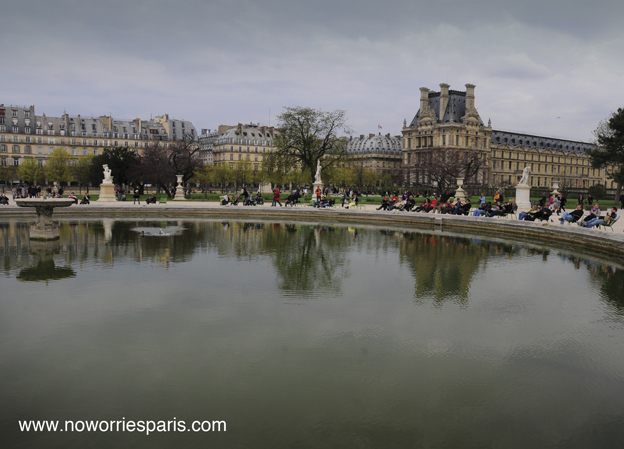 The Palace of Tuileries was commissioned by Catherine de Medici in 1564 on the site of a tile factory (hence the French name ‘Tuilerie’ deriving from ‘tuile’ – tile). 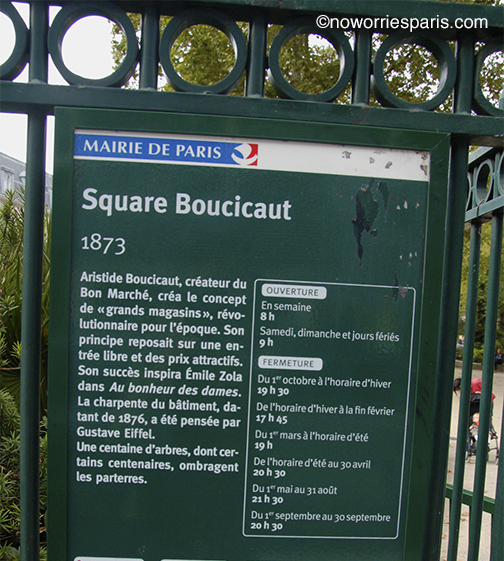 Young Louis XIV lived there, as did Napoleon Bonaparte who made the Tuileries the centre of his imperial power. 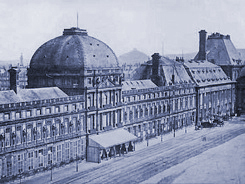 It was severely damaged by a fire during the 1871 upheaval of the Paris Commune and the government resolutely cleared away the ruins in 1883. Rumor has it that it will someday be rebuilt. 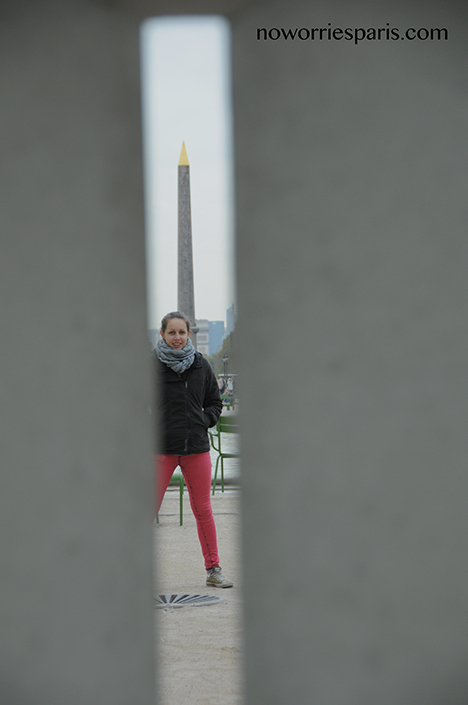 If you stand in the center of the Tuileries Garden, you can try to locate ‘the spine’ of Paris: In one direction, you should be able to see all the way down the Champs Elysees to the Arc de Triomphe. Still in a line beyond that lies La Defense, the Grand Arch. In the other direction is the Place du Carrousel, IM Pei’s pyramid in the Louvre courtyard and much farther away (and not to be seen from ground level), the Bastille (demolished during the French revolution). The July Column takes its place. Now you can slump in one of those free chairs, relax and fantasize about what transpired exactly where you’re sitting ….. or just doze off.